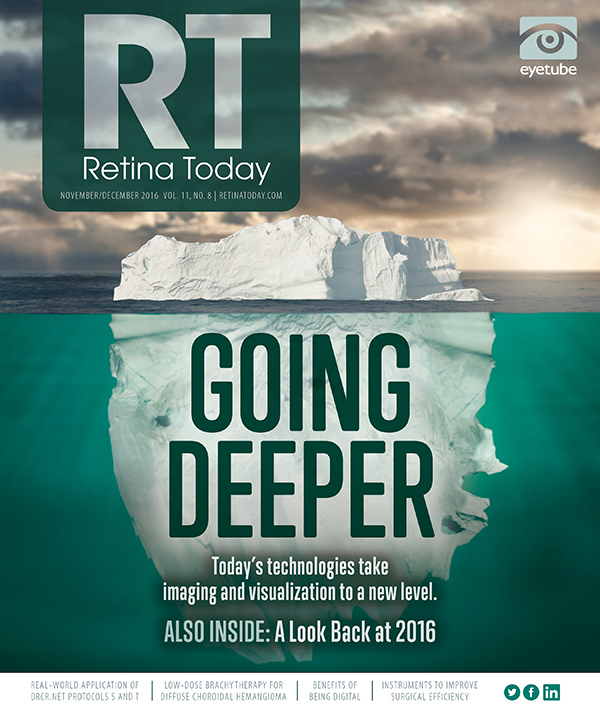 We are at the tail end of another successful year for the retina world. It is pretty amazing that one area of the eye care industry can continue to grow and expand as much as retina has. The following pages contain highlights of some of the news and headlines from the past 12 months. The information herein is presented in no particular order and is by no means a complete representation of all things newsworthy. The US Food and Drug Administration (FDA) approved the 0.5-mg prefilled syringe (PFS) of ranibizumab (Lucentis, Genentech) as a new method of delivering the medicine. Expected to be available in early 2017, the PFS may be used to treat patients with wet age-related macular degeneration (AMD) and macular edema secondary to retinal vein occlusion, according to the FDA. The agency also accepted a supplemental Biologics License Application and granted priority review for ranibizumab for the treatment of a new indication: myopic choroidal neovascularization. Ocular Therapeutix announced that it had entered into a strategic collaboration, option, and license agreement with Regeneron Pharmaceuticals to collaborate on the development of a sustained-release formulation of the anti-VEGF agent aflibercept (Eylea, Regeneron) already in preclinical development for the treatment of wet AMD and other serious retinal diseases. Adalimumab (Humira, AbbVie) received FDA approval for the treatment of adults with noninfectious intermediate, posterior, and panuveitis. Mark S. Humayun, MD, PhD, received the National Medal of Technology and Innovation in January for his work to restore sight, including the development of the Argus II Retinal Prosthesis System (Second Sight Medical Systems). Both US company Second Sight Medical Products and French company Pixium Vision kept busy this year. In February, Second Sight announced the publication of positive 3-year data from the FLORA study on the Argus II Retinal Prosthesis System. The company also presented 5-year outcomes with the retinal prosthesis during the annual Macula Society meeting. In March, Pixium announced that the first IRIS II epiretinal implant, intended for patients who have lost their sight due to retinitis pigmentosa, was implanted and successfully activated in January. In August, Pixium announced that it had been awarded the CE mark for its IRIS II bionic vision system. Then, toward the end of the year, Second Sight made two announcements. In October, the company reported the first successful implantation and activation of a wireless visual cortical stimulator in a human subject, providing the initial human proof of concept for the ongoing development of the company’s Orion I Visual Cortical Prosthesis. And in November, the Centers for Medicare and Medicaid Services finalized its Medicare hospital outpatient payment rate for calendar year 2017, which includes the cost of the Argus II. The American Medical Association Current Procedural Terminology Editorial Panel also approved two new Category III CPT codes for initial and subsequent programming of the Argus II. Optovue announced commercial availability of AngioAnalytics, the next generation of its optical coherence tomography angiography (OCTA) technology available on the AngioVue Imaging System, for use outside the United States. According to the company, this new version enables clinicians to quantify the density of blood flow in the retina to help manage diseases such as diabetic retinopathy and AMD that cause progressive blindness. Optovue also announced the availability of its proprietary imaging system AngioVue Retina, which provides noninvasive, dyeless visualization of blood flow in the retina. The company says AngioVue Retina is configured with essential OCTA and OCT features designed specifically for retinal practices to allow adoption of OCT and OCTA into the clinical workflow with minimal disruption. Visunex Medical Systems reported that it received FDA clearance for the PanoCam Pro Widefield Imaging System for use on newborn infants. Visunex says the wireless imaging system fills an unmet need in the imaging of newborn babies that may help detect external, anterior, and posterior segment vision disorders. The following month the company announced that it had received CE Mark for the PanoCam LT Wide-field Imaging System, which is also designed to detect a number of external, anterior, and posterior segment vision disorders in premature and newborn babies. Visunex says the system can be used for general ophthalmic imaging and eye disease inspection in children up to 6 years old. Heidelberg Engineering unveiled the Flex Module for its Spectralis imaging platform, which enables all Spectralis examinations to be performed on patients lying down in the supine position. The company also introduced its new OCT2 Module, which has a high scan rate of 85,000 Hz, cutting acquisition time in half while delivering excellent image quality. Lastly, Heidelberg revealed the Widefield Imaging Module, with its simultaneous 55-degree fundus and OCT imaging. Haag-Streit introduced the Fundus Module 300, which offers users of current Haag-Streit slit-lamps access to instant documentation of the retina by allowing integration of nonmydriatic retina imaging as part of the regular slit-lamp evaluation. Bausch + Lomb announced the latest additions to its 27-gauge product portfolio for retina surgeons: a Diamond Dusted Membrane Scraper and a Directional Laser Probe. The company also reported the availability of its Illuminated Directional Laser Probe, which it says combines the light technology of the company’s illuminated laser probe with the fiber capabilities of its directional laser probe. The 3D OCT-1 Maestro (Topcon Medical Systems), which combines a high-resolution color nonmydriatic retinal camera with spectral-domain OCT technology, became available for sale in the United States. The FDA issued 510(k) clearance for Nidek’s solid state GYC-500/GYC-500 Vixi Green Scan Laser Photocoagulator. According to the company, the laser achieves stable treatment outcomes for multiple applications including retinal photocoagulation, trabeculoplasty, and iridotomy. The company also launched AngioScan, an upgraded OCTA software that enables visualization of retinal and choroidal microvasculature and blood flow using the RS-3000 Advance OCT system. Finally, Nidek received FDA 510(k) clearance for its MP-3 Microperimeter, which now includes a wider range of stimulus intensity, from 0 to 34 dB, compared with the MP-1. The Easyret fully integrated 577 nm yellow photocoagulator (Quantel Medical) was launched. CenterVue unveiled the Eidon AF true-color confocal scanner that adds autofluorescence imaging capabilities to the platform’s image quality, features, and functions. The Ngenuity 3D Visualization System was launched by Alcon, in collaboration with TrueVision 3D Surgical. The system is a platform for digitally assisted vitreoretinal surgery that is designed to enhance visualization of the back of the eye for improved surgeon experience. Ellex Medical unveiled the Tango Reflex Laser System that combines the company’s proprietary Reflex Technology for posterior and anterior YAG laser procedures with its SLT technology. The Smart 532 photocoagulator (Lumenis) was launched. The device is powered by SmartPulse subthreshold technology and provides superior laser stability due to its advanced laser cavity technology. OD-OS released its compact and intuitive Navilas 577s laser system to Europe and other non-US markets. Notal Vision announced the availability of its ForeseeHome AMD Monitoring Program for eligible Medicare patients in the United States. The past year saw quite a bit of activity in the clinical trial sector, with most of the action taking place in the second phase of research and with AMD demanding much of the limelight. The rest of the spring and summer were quiet in the way of new phase 1 studies, but things picked up in October, when SciFluor Life Sciences announced that the first patients had been dosed in both phase 1/2 trials of SF0166 topical ophthalmic solution as a potential treatment for diabetic macular edema (DME) and wet AMD. Each trial has two dose groups of up to 20 patients with an aim to collect safety and tolerability data and to record changes in retinal thickness and visual acuity. In June, adalimumab (Humira, AbbVie) received approval from the FDA to treat adults with noninfectious intermediate, posterior, and panuveitis, becoming the first and only FDA-approved noncorticosteroid therapy for these indications. PAN-90806 in patients with neovascular AMD in 2017. At the top of the year, Clearside Biomedical announced positive results from its phase 2 Dogwood trial of its proprietary form of triamcinolone acetonide, CLS-TA (Zuprata), using suprchoroidal space drug administration for the treatment of patients with macular edema associated with noninfectious uveitis. Administration of CLS-TA resulted in a statistically significant mean change from baseline in central subfield thickness at 8 weeks after a single treatment, which was the primary endpoint (P = .0018). Statistical significance was also achieved in the mean increase from baseline in best corrected visual acuity (P = .0004), a secondary endpoint. Also in January, the first patient was enrolled in the ThromboGenics phase 2 CIRCLE study evaluating the efficacy and safety of multiple doses of ocriplasmin (Jetrea) in inducing total posterior vitreous detachment (PVD) in patients with nonproliferative diabetic retinopathy (NPDR). Rounding out the month, Ophthotech announced that the first patient had been dosed in a phase 2/3 clinical study of avacincaptad pegol sodium (Zimura), an inhibitor of complement factor C5, in patients with geographic atrophy. In April, Clearside Biomedical reported that its phase 2 Tanzanite clinical trial evaluating concomitant administration of CLS-TA, delivered suprachoroidally, with intravitreal aflibercept for the treatment of patients with macular edema associated with retinal vein occlusion achieved its primary endpoint. Researchers randomized patients to receive a single dose of aflibercept monotherapy or a single dose of concomitant administration of aflibercept and CLS-TA. Patients were assessed each month for 3 months and were treated with aflibercept therapy for disease recurrence. After 3 months, researchers determined that patients who received concomitant therapy before the 3-month assessment period required 60% fewer injections of aflibercept during the 3-month period compared with those who received aflibercept monotherapy at the trial’s start (P = .013). The following month, Aldeyra Therapeutics released a statement saying that a randomized, multicenter, investigator-masked, comparator-controlled, parallel-group phase 2 clinical trial of topical ocular NS2, a first-in-class aldehyde trap, demonstrated activity comparable to standard-of-care topical ocular corticosteroids in reducing anterior chamber cell count in patients with active noninfectious anterior uveitis. Skip ahead to July, when Clearside Biomedical reported additional topline data from its phase 2 Tanzanite trial. At this time the company noted that 78% (18/23) of patients in the active arm of the trial did not require additional treatments during the 3-month trial compared with 30% (7/23) in the control arm (P = .003). anti—platelet-derived growth factor (anti-PDGF) receptor beta antibody rinucumab (Regeneron) in patients with neovascular AMD failed to reach its primary endpoint. A company press release reported that at 12 weeks, the combination therapy did not demonstrate an improvement in BCVA compared with aflibercept monotherapy. The Ngenuity 3D Visualization System was launched in September by Alcon, in collaboration with TrueVision 3D Surgical. In October, Ophthotech announced that the phase 2b study results of its anti-PDGF agent pegpleranib (Fovista) administered in combination with ranibizumab therapy for the treatment of wet AMD had been published in Ophthalmology. The article reports that pegpleranib 1.5 mg, administered in combination with ranibizumab, met the prespecified primary efficacy endpoint of mean change in visual acuity. Patients receiving the combination therapy gained a mean of 10.6 letters of vision on the ETDRS standardization chart at 24 weeks, compared with 6.5 letters for patients receiving ranibizumab monotherapy (P = .019). Allegro Ophthalmics’ DEL MAR phase 2b clinical trial evaluating ALG-1001 (Luminate) in 136 patients with DME met its primary and secondary endpoints, demonstrating promising visual acuity gains and reduction in central macular thickness that were equivalent to bevacizumab (Avastin, Genentech) monotherapy. The primary endpoint was noninferiority to bevacizumab (defined as ≤3 letter difference) in mean change in BCVA at 20 weeks. The ALG-1001 results were achieved after three injections and 12 weeks off treatment, compared with six injections given every 4 weeks with bevacizumab. The company also announced completion of enrollment in its PACIFIC phase 2b clinical trial evaluating the safety and efficacy of ALG-1001 in inducing PVD in patients with NPDR. The trial enrolled 100 patients who were randomized to one of five treatment groups that included four ALG-1001 groups (1.0 mg, 2.0 mg, 3.0 mg, or 4.0 mg) and a balanced salt solution placebo group. Topline results are anticipated to be available within the first half of 2017. Eyegate Pharmaceuticals reported in January that the first patient had been enrolled in a confirmatory phase 3 clinical trial of its EGP-437 combination product for treatment of noninfectious anterior uveitis. The results from the ThromboGenics 2-year OASIS phase 3b study with ocriplasmin were published in August in Ophthalmology. The study was designed to provide long-term controlled efficacy and safety data for ocriplasmin in patients being treated for symptomatic vitreomacular adhesion (VMA). In its conclusion, the paper confirms that the OASIS trial demonstrates the long-term safety and efficacy of the drug, providing improved resolution of symptomatic VMA compared with previous phase 3 trials and with no additional safety signals identified. An analysis of data from the phase 3 HARBOR study in September resulted in the finding that pigment epithelial detachments of any size can be effectively treated with low-dose ranibizumab in patients with subfoveal neovascular AMD. According to the recent VISUAL I phase 3 clinical trial, adalimumab is an effective therapy for patients with noninfectious uveitis but is associated with more adverse effects than placebo. Patients enrolled in this study were at least 18 years old with active, noninfectious uveitis that had been unresponsive to 2 or more weeks of glucocorticoid therapy. In February, all three anti-VEGF agents evaluated in the Diabetic Retinopathy Clinical Research Network Protocol T trial were found to be effective at treating patients with DME at 2 years, according to a study update. Additionally, some significant differences between the drugs seen at the 1-year time point were no longer present at year 2.